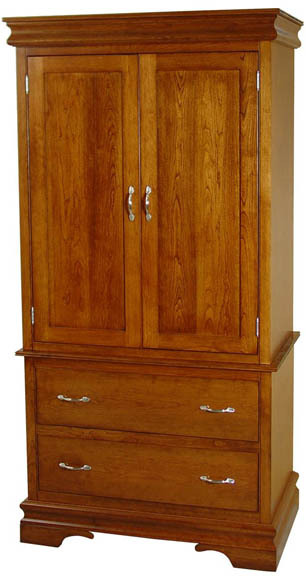 Part of the complete Heirloom Sleigh Collection, the Heirloom Sleigh Armoire is sturdily built by the Amish out of your choice of solid oak, solid cherry, quarter-sawn oak, hickory, maple or elm, and can be stained in your choice of finishes. The bottom features 2 full-width drawers and the doors at the top conceal 2 half-width bin-style drawers and 3 shelves. The Heirloom Sleigh Armoire does not feature felt-lined hidden drawers like the dressers and mule chest do, but features the same elegant styling as the rest of the collection. See below for a link too see the Armoire with the doors open. Price shown is for solid oak, please contact us for pricing in other woods.